0 Comments Published by KL Ocs Kid on Monday, May 14, 2007 at 9:17 AM. 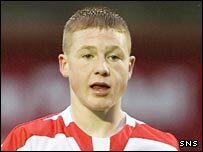 James McCarthy has rejected a move to Liverpool that could have earned Hamilton Accies £1m for the 16-year-old midfielder, his agent has claimed. Celtic, Rangers, Reading, Sheffield United and Tottenham Hotspur were also interested in McCarthy. Agent Bill McMurdo told The Sun: "Liverpool wanted to take him to Italy for a tournament last week. "They agreed to meet Hamilton's asking price, which would have earned them around £1m if James made the grade." McCarthy has made 24 appearances for First Division outfit Accies after breaking into the first-team at New Douglas Park. "Sheffield United were also desperate to sign him and said they would put him straight into their reserve side," added McMurdo. "They said he would be in the first team within a year. "Reading and Spurs were also after James, while here, Rangers and Celtic are interested. "But he has decided that he wants to stay with Hamilton for another year. "I can't fault his judgement. He has only just left school and is from a close family. "If he feels happier waiting for another season then that is the right thing to do."